ROSEBURG (United States) • Students at a US college in Oregon where 10 people were killed by a lone gunman on Thursday have described scenes of panic and terror as they ran for their lives or hid in classrooms. "I probably heard a good 35 to 40 shots," Ms Cassandra Welding, who was in an adjacent room to the shooter, told local media. She said a fellow student at Umpqua Community College in rural Roseburg opened a connecting door to check what was happening and was shot. "Then we locked the doors, turned off the lights and... We were all pretty much in panic mode and called 911 and our parents and (said) 'I love you' because we didn't know what would happen, if those were our last words. "We put our backpacks in front of us, chairs, whatever we could, to shield ourselves in case he came in." The gunman - identified by US media as Chris Harper-Mercer, 26 - opened fire in a classroom, then moved to other rooms, methodically gunning down his victims, witnesses said. Douglas County Sheriff John Hanlin said 10 people were killed and seven were injured, several critically. He declined to say whether the gunman was included in the death toll. At a news conference, Sheriff Hanlin vowed never to utter the gunman's name. "I will not give him the credit he probably sought prior to this horrific and cowardly act." Police recovered three handguns and an assault rifle at the scene along with a cellphone that presumably belonged to the shooter, who wore a bullet-proof vest. It was not clear whether he fired all weapons. One man whose daughter was wounded told CNN that the gunman, who did not attend the school, ordered students to stand up if they were Christian and then shot them. "They would stand up and he said, 'Good, because you're a Christian, you're going to see God in just about one second,' " Mr Stacy Boylan said, relaying his daughter Ana's account. He said Ana, who survived by playing dead, told him the shooter burst into the classroom and first shot the professor point blank. Student Brady Winder said he was in class on what was the fourth day of the school year when he heard a loud pop at around 10.40am from an adjoining classroom. He said he initially assumed it was a desk or someone hitting the floor. He said his teacher called out through the door to see if everything was okay and then further shots rang out. "Somebody said these are gunshots. We all froze and bolted out the door," he told local media. "I didn't really have any time to think. It was fight or flight." Some students on the sprawling campus said they had no clue something was amiss until they heard police and ambulance sirens and the school was placed on lockdown. Others could be seen hugging and crying as they exited the school and were put on buses that took them to safety, where anxious parents and family awaited. The college has some 3,300 students. Authorities said they would not release the names of the victims for 24 to 48 hours. A candlelight vigil was held late on Thursday. 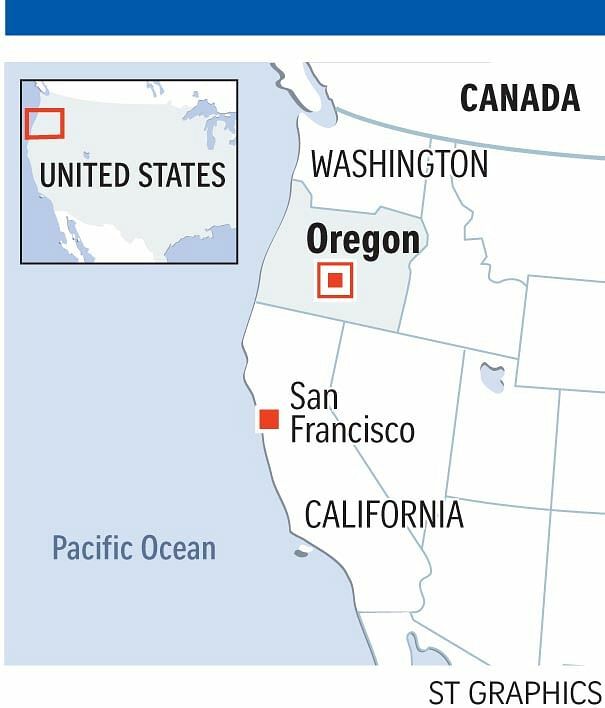 Police, meanwhile, sealed off the gunman's apartment in Winchester, some 8km north of Roseburg, and interviewed neighbours and relatives, CNN reported. Neighbours described him as a nervy 26-year-old who lived close to the campus. Mr Steven Fisher said he used to see him in the playground with kids. "He seemed skittish, always looking over his shoulder to see if anyone was watching." The culprit described himself in an online dating site as "shy at first" and a "teetotaler" living with his parents. His father, Mr Ian Mercer, told reporters he was shocked and that he had spoken to the police.